What Positions Can I Realistically Outsource? Companies are on a constant quest to find ways to cut expenses and improve productivity. However, cutting the wrong expenses can be counterproductive, and in some cases, detrimental. So, what do you cut when your bottom line is on the line? One option is outsourcing. Savvy businesses are finding they can recruit top talent and drastically reduce costs by hiring independent contractors. For one, employers do not have to provide independent contractors with benefits such as paid leave and healthcare. Companies also only pay for time used. For instance, let’s say your company would like to work on boosting public relations efforts, but there is not enough “newsworthy” happenings to justify hiring a full time employee. Outsourcing to a public relations firm or freelancer gives you the flexibility to employ their services as needed, rather than paying one person a salary with benefits. And, in some cases, outsourced workers can be paid as 1099 contractors, saving your company the time and cost of submitting payroll taxes for them. 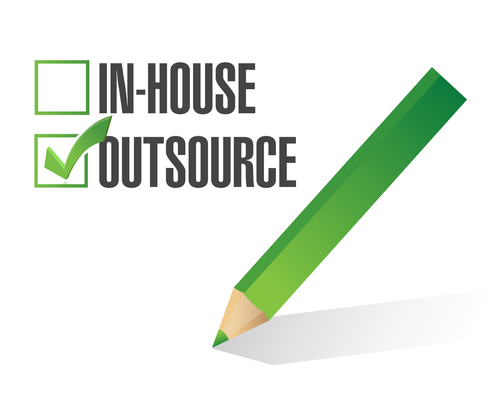 Another advantage to outsourcing is you are gaining an outsider’s perspective. Often, when a contract employee begins working with a company, they can objectively identify obstacles and opportunities management and staff may not see. Once you decide outsourcing is a possibility, the next step is to determine which positions or duties can realistically be contracted out. Ultimately, this will depend on your company structure; however, there are a few key core activities you can examine first to help you get started. Sales efforts are one of the most popular tasks to outsource. Many companies are reaping the benefits of contracting with call centers to help develop leads, manage outbound sales campaigns and conduct market research. Call centers can work in conjunction with your inside sales staff to help drive results. One obstacle for sales staff is having to take time to develop leads and research. When a call center performs the legwork, your sales representatives are prepared with solid leads and good market research, thus increasing the likelihood of converting a prospect into a customer. Fear of cost is one of the main reasons companies tend to handle these duties in-house. While larger agencies can be pricey, there are a number of smaller firms and even freelancers who are willing to tailor their pricing to accommodate your budget. Remember, most of the really good professionals in this field specialize. Graphic designers are graphic designers. While they can write, many are not copywriters. And, while some copywriters may be able to work their way around InDesign, they are generally not artists. These are all very specialized skill sets, which is why outsourcing to an agency can prove beneficial. Agencies tend to have dedicated talent in each of these areas. You get the “results’ of hiring four employees without the significant cost. Many companies are finding they can outsource much of their human resources (HR) efforts. While you probably want to maintain an in-house manager, a good outsourced HR provider can eliminate the need to staff a large department. From payroll and benefits to recruiting and employment screenings, there are companies who can manage it all for you at an affordable price. Taking time to examine your business structure and identify areas and tasks that can be outsources is the first step. Just like employee, be sure to research providers to find the right “fit”. Then, don’t be afraid to give it a try. You will likely be amazed at the money you save and wonder why you didn’t consider it sooner!